If you had asked me years ago “is it possible to make money from home in Canada”, I would’ve laughed and said it was a pipe-dream. Now, I am learning that there are so many ways for Canadians to earn extra cash both online and off through a number of different avenues. As a single income, homeschooling family with multiple children, this extra money goes towards our day-to-day living expenses, paying down debt, home learning supplies and splurges for fun vacations and indulgences. My extra income is a combination of coupon savings, cashback earnings, payments for surveys, freelancing, odd jobs and various side hustles. If you want to learn more about any of the sources that I have earned from, simply click on it to be directed to a review I have written or the site itself. My earnings are minuscule at best. This is simply because I only have 2-3 hours (often less) to spare each night on money making endeavors. Nevertheless, those couple of hours are enough to give me, a stay-at-home mom extra spending money each month. Remember, I share my extra earning sources to give you more ideas on how to make extra cash on the side. Please feel free to ask in the comments if you have any questions as I am happy to help! 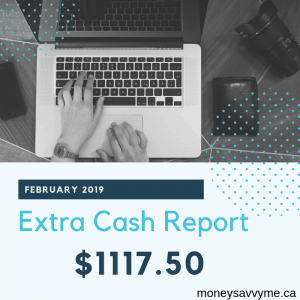 2019 is definitely getting off to a good start for this Canadian’s extra income! A payout from Adsense for my blog, along with a big newspaper payment, I ended up with an extra $1117.50 in February! With this extra $1117.50, my total extra money for 2019 is at $1998.13 – 11% of my $18,000 goal! Where did your extra income come from in February? 5 Swagbucks – expires 3pm PST today!